Boyd Allen Alexander was born on 16th May 1923 in Webb City, Oklahoma, his parents were Edgar George and Emma (Dobkins) Alexander. Boyd had one uterine brother Edgar Jack. When the boys were quite young their mother passed away. Boyd and Jack came to live with Uncle J. C. and Aunt Cassie Alexander and were adopted by them. Edgar, Boyd’s father and Uncle J.C. were brothers and Emma and Aunt Cassie were sisters thus making the children double cousins and now brothers. J. C. & Cassie raised six boys and one girl. The Alexander family lived in Phillips, Texas and the children attended the Phillips Schools. The family was protestant and was charter members of the Methodist Church in Phillips established about 1926. The Alexander family was known as a large loving family with Doyle, Keith, Gale, Stanley, Jack, Boyd and Sister Wanda Jean... Raising children in the Texas Panhandle in the early boom days of the oil business was not an easy job parents had to be tough. Cassie seemed to have that inter strength at age 41 she had five teenage boys and two babies. Boyd Allen graduated from Phillips High School in 1940 and was known as an all round athlete playing; basketball, football and going to state for the track tournament. He attended NMMI (New Mexico Military Institute) and graduated from there in 1942. He excelled in track and while at NMMI he ran the fastest quarter mile (440 yards) in the state track history in New Mexico. He was instructing at Roswell Military Institute when he enlisted in the army in March 1943. He entered the service August 5, 1943, at age of 20 years and received his first training at the Officers Training Camp at Fort Benning, Georgia. Boyd could be called a true volunteer for he volunteered for the service, then he volunteered for the paratroopers and then he volunteered as a replacement paratrooper and was sent overseas immediately. 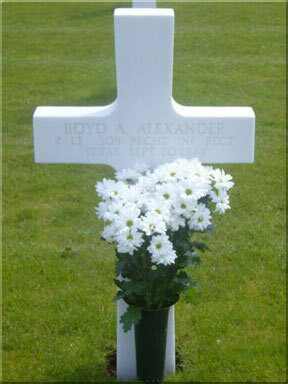 At the time of Boyd’s death he had three brothers in the service Gale serving in France, Jack was in the Pacific and Doyle stationed in the United States. There were still two brothers at home Keith and Stanley and the little sister Wanda Jean. 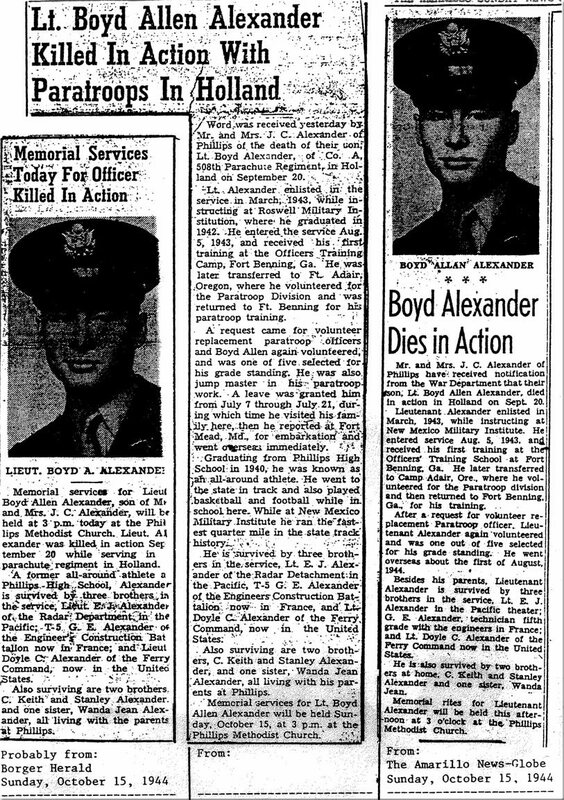 Second Lieutenant Boyd Allen Alexander paid the supreme sacrifice on September 20, 1944 while making a parachute jump over the Nijmegen area, the Netherlands. 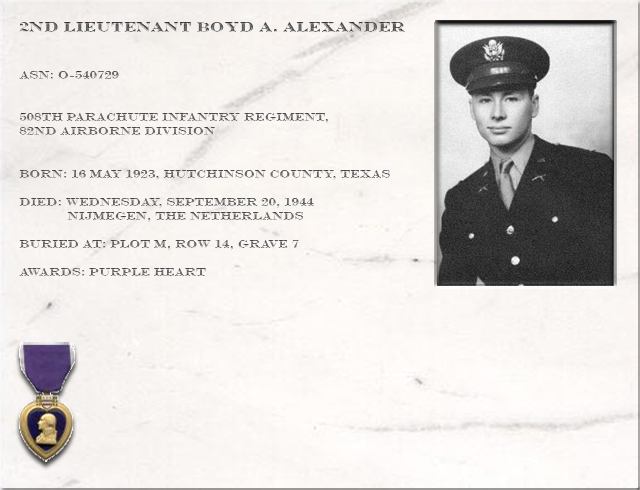 Boyd was in Company A 508th Parachute Infantry Regiment. He is buried at the Margraten Military Cemetery in the Netherlands. It cannot be said that Hutchinson County located in the northern Texas Panhandle did not contribute it share during World War II. A small county of approximately 35,000 people contributed about 2000 men to the service of our country. Most of the servicemen were volunteers not waiting to be drafted but volunteering so as to pick the branch of service they wished to serve in. It has been said that Hutchinson County had more volunteers for its size that any county in the nation. On March 25, 1944 our local newspaper THE BORGER DAILY HERALD published a Special edition newspaper 8 section containing 96 pages with 1700 pictures of men and women in uniform serving our country. Finding that many servicemen had been missed on April 9, 1944 they published a 10 page supplement bringing the total number of servicemen to about 2000. The losses were great for this county as 91 were KIA (killed in action). 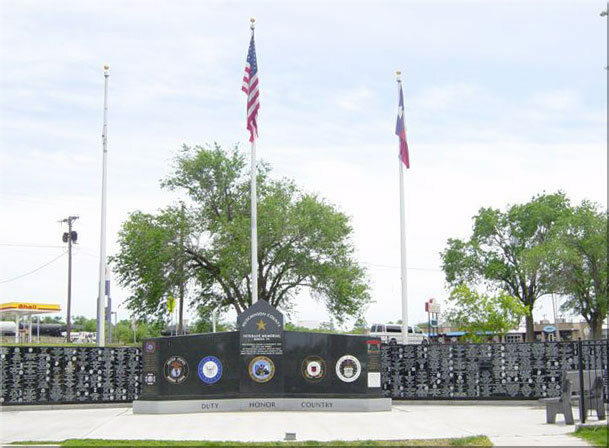 The local Veteran’s organizations and the community have erected a beautiful memorial in Huber Park in Borger, Texas. On the back side of the Memorial names of all KIA’s from all wars from this county are engraved. 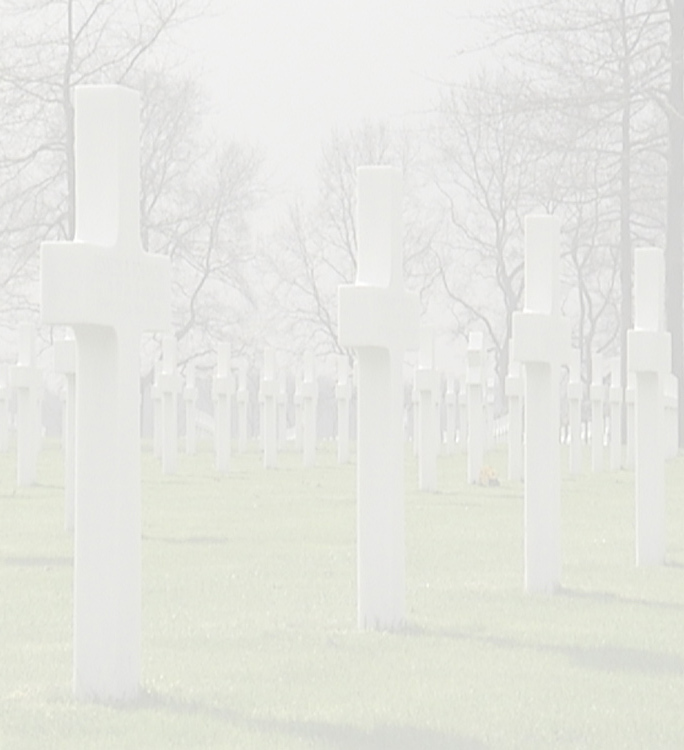 A space has been provided for veterans or their families to place memorial plaques for their loved ones. 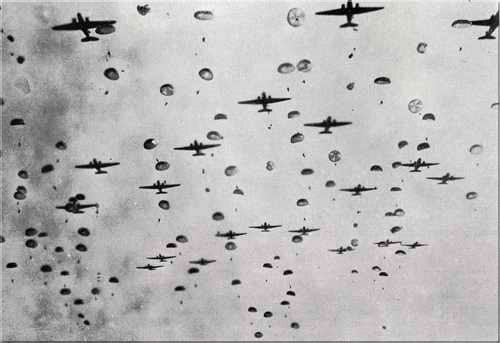 During the war years Borger provided many different types of materials for the war effort. The northern part of the county had wheat farming and cattle ranching. The southern part of the county produced oil, gasoline refining, a rubber plant and many carbon black plants that produced the carbon used in tires. Boyd A. Alexander and Otis L. Grant were both from Hutchinson County, Texas. 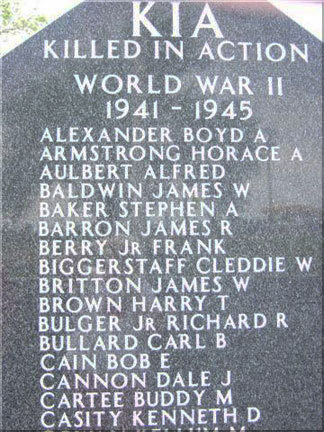 They attended different High Schools Boyd at Phillips High and Otis at Borger High, both are now buried at Margraten. There may be others from our county at Margraten but they are not known to this researcher. I was born in Lawson, Arkansas in January 1932. My parents moved back to Texas when I was three weeks old. We moved to Borger when I was twelve years old... I attended Borger Public schools... I am now 76 and my husband retired in 1985 so I am now able to work full time with my hobby of Genealogy. I have been married almost 59 years I have two children a boy and a girl. I have two grandchildren and three great grandchildren. I began working on my family tree in 1978 but now I help other people with their research... I do not consider myself as a professional genealogist I don’t charge for my work. I have used a Bible Scripture for the basis of my work. I Peter 4-10. “Each of you has been blessed with one of God’s many wonderful gifts to be used in the service of others. So use your gift well”. I feel so blessed having helped two families meet if only through the Internet. My purpose in doing genealogy is to preserve family records and history for the future. Everyone needs to know their heritage.